Is Mulong the new David vs Goliath in Biliran political arena? Can he throws the killer stone against the political giant reigning the island province for more than three decades? These are the questions which kept on hunting, and even bothering some political observers after his name surfaces anew in Biliran political landscape. After several years of service as executives in various capacities in national government offices, he now engages again in a world that made him of what he has achieved at present. But who really is Mulong? Romulo Villegas Bernardes, is a true blooded Navaleno having been born and raised in Naval town. He spent his elementary grades at the Naval Central School. He finished his high school, college, and his post-graduate studies at the Naval Institute of Technology now the Naval State University. Mulong served as member of the Sangguniang Panlalawigan for the 1st District of Biliran for three consecutive terms in 1995, 1998, and 2001. 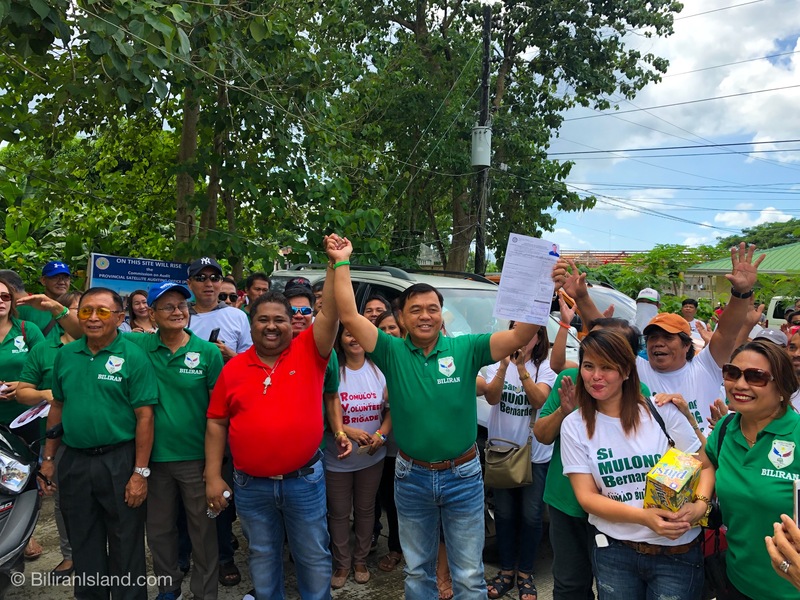 After his productive political stint as provincial board member, he decided to tread another endeavor, that of an assistant and later the regional director of the Land Transportation Franchising and Regulatory Board (LTFRB) in Region 7. He was also the Executive Director of the National Maritime Polytechnic before he officially enrolled his name in Biliran political arena on November 23, 2018. Riding on a political cliche of being a ‘lumad’ is his initial battlecry, which for some political pundits, his edge and an advantage over the Espina political clan, lording over the ‘lumads’ for quite a time. His entry back in Biliran politics sent his rival, Governor Gerryboy, to attend even the minute of event in the province, just to catch up the innate public relations charm of Mulong. To ordinary Biliranons, whose only gauge of winnability of a certain candidate, is the stockpile of crispy bills, Mulong is a far cry compared to the financial arsenal of the Espinas. But nevertheless, some Biliranons, still have that high hopes, Mulong can fire that stone which may lead to the untimely demise of the political giant in Biliran. Who knows? Moreover, Mulong has inspired politcal unknowns to surface like former Judge Dulcisimo Pitao, Sr., and Dr. Edita Sabonsolin Genson, as mayoral and vice-mayoral candidates of Naval, respectively, facing the ‘poster boy’ of entertainment leadership, Gerard. Some keen political analysts in the province have it that Mulong is a Roger Espina political ploy to destruct the political career of his younger brother Gerryboy, and same is true with gubernatorial candidate Edwin Masbang, as a Gerryboy Espina candidate, to match the political greed of his older brother. Whatever it takes, it is the same Espina with another name, they opined. Whatever the speculations put in the air, one thing is certain minus the speculation above, the 2019 elections is an uphill battle for the Espinas, as the political giant in Biliran, is now facing the myriad of Davids, basing on their political opponents present in every towns in Biliran. What is worst, Mulong could even ignite a political coup de etat for the six mayors, to finally break away, for reason of lack of political control and grip of the Espinas over their political pawns. Whatever the outcome in the May 13, 2019 mid-term elections, it is not about Mulong and his cabals in the opposition, neither the Espinas and his cohorts, but the welfare of Biliranons is of great stake, who after elections, automatically surrendered and subjugated their fate to the leaders they elected. Every election must not be likened to a popularity contest, nor a time to make money that lasts only for days in one’s pocket, but should be observed as a sacred undertaking, and a solemn dispensation of our political rights of suffrage. Mulong and the rest of the Espinas, are the only choices we have, and how evils we perceived them to be, we have in us the stone, either we give it in the hands of David to topple down Goliath, or we remain in a status quo in the hands of the get-all-that-they-can governance. Well, the choice is yours Biliranons to think about.